Super lightweight, strong and available in a range of awesome colours, Elephant Stripes travel packing cubes are next generation. If you want to fit twice as much into your luggage while staying stylishly organized these travel packing cubes are your answer. Arrive looking fresh by rolling your clothes into these pods to reduce wrinkling during travel. 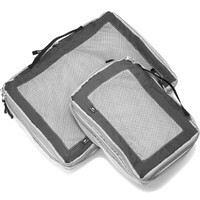 Eagle Creek’s Packing Cube Set is a great packing organizer, letting you get the most out of your luggage space. The set includes a Pack-It Cube, Pack-It Half Cub, and a Pack-It Quarter Cube. The REI Expandable Packing Cube Set includes a medium and large cube to help you organize and neatly fit more contents into your luggage. 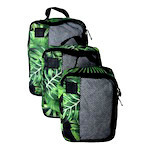 Each cube includes a mesh window that lets you see inside, zipper expands cube size, and each cube includes a carrying handle. 4 Packing Cubes -Extra Large( 17.5″ x 12.75″ x 4″) Large (13.75″ x 12.75″ x 4″) Medium (13.75 x 9.75 x 4) Small (11″ x 6.75″ x 4″). Laundry Bag for storing dirty clothes at the end of your travels.